Jesse LeFevers powers ahead of Austin McDaniel for the Bojangle's Late Model Win. NEWTON, N.C. (March 24, 2012) Weather was threatening on Saturday March 24 as racing got under way at Hickory Motor Speedway in Hickory, N.C. Round two of the schedule featured six series at the .363 mile oval. 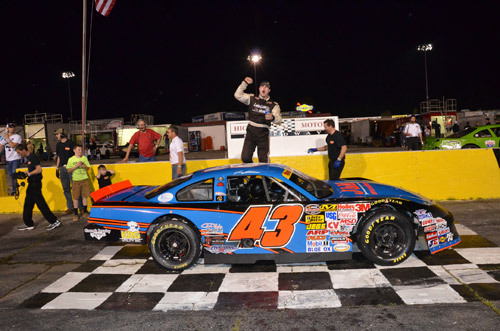 2011 Hickory Motor Speedway Track Champion, Jesse LeFevers found his way to victory lane for the first time this season after battling with Austin McDaniel for 50 laps. The races kicked off with the Sportsman Racing Classic series. Bill Well in the No. 16 car started on the pole for this 25 lap feature event. Throughout the race the yellow flag was thrown on three separate occasions. Keith Hiblebran in the No. 66 took the checkered flag for the Sportsman Classic series. Due the weather approaching the area the Paramount KIA Limited Late Models raced second tonight with Monty Cox, No. 21 starting on the pole. The 35 laps for the feature event were run without a caution flag being thrown. Pole sitter, Monty Cox brought home the victory with a close race for second occurring behind him. In the end, Charlie Watson in the No. 9 took second place and No. 15 of Brandon Atkinson finishing third. his night of racing on the pole. The 50-lap feature began with a five car break away at the front of the pack. The yellow flag dropped for the first time of this race shortly after due to contact between the No. 8 of Chandler LeVan and the No. 11 of Matt Piercy. The green flag dropped once more, with LeFevers in the lead. At lap 12 the caution flag flew for the second time of the evening for debris on the track. Drivers once again took the green flag on lap 13. Caution waved for a third time for Jeremy Sorel in the No. 77 car when he hit the wall in turn four, leaving debris on the track. With five laps to go, LeVan spun on the speedway, bringing out the fourth yellow flag of the event. The last four laps of the race saw almost as many cautions as there were laps. A yellow was brought out when Darren Hagen in the No. 23 went around. Another caution waved when Mackena Bell in the No. 4 car hit the wall coming out of turn four. The last caution of the event flew due to a spin in turn four by Sorel. Although the end of the race was messy, LeFevers brought home the victory with Austin McDaniel finishing in second place and David Roberts finishing third. This checkered flag didn't fly without another accident occurring between Clayton Pyne in the No. 6 and LeVan. The WrenchRags Street Stock Series took to the track next with No. 03 Kevin Eby leading the way. The yellow flag flew for the No. 14 of Samuel Thompson when he spun around on the back stretch. Another caution flag flew when Marshall Sutton in the No. 64 hit the wall. The yellow flew for the third time of the event when the No. 99 of Ray Smith backed into turn two due to his car snapping out from under him. Eby would claim the checkered flag, leading every lap of the event. Mike Newton in the No. 5 finished second and Jason Stanley in the No. 92 brought home the third place finish. The 4-Cylinders took to the track with the No. 6 of Caleb Sisk on the pole. The field of five raced a clean 25 lap feature. Sisk lead all laps of the event and took the checkered flag with the No. 21 of Todd Harrington bringing home second place. Nathaniel Kanupp in the No. 51 brought the third place finish home to his team. The Red Baron Renegades raced the final event of the evening with their 20 lap feature race. Eddie Russ in the No. 14 began the race on the pole. The caution flew once during the event when Greg Austin in the No. 4 lost his right rear wheel on the front straightaway. The race continued without incident and Russ brought home the final win of the night. The No. 64 of Darby Crouch finished second and Brad Nelson in the No. 7 brought home third. Next Saturday evening the Bojangle's Late Models, Paramount KIA Limited Late Models, WrenchRags Street Stocks, Red Baron Renegades, Super Trucks and Hobbies will take to the speedway. Gates open to fans at 5 p.m., with qualifying immediately following. An On-Track Autograph Session begins at 6 p.m., with feature racing action at 7 p.m. For more details visit www.hickorymotorspeedway.com .